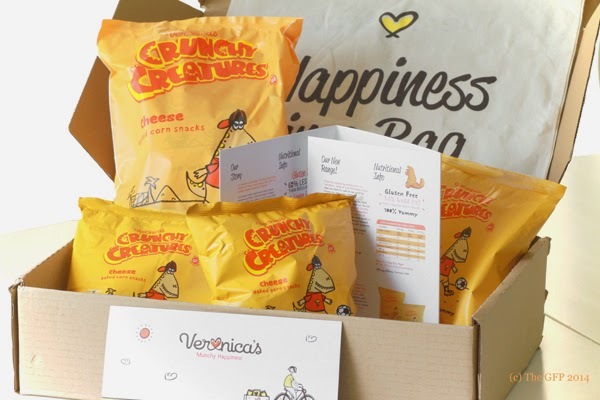 Earlier in the week, I received an email from a representative over at Veronica's Snacks http://www.veronicassnacks.com inviting me to try their new range of gluten free baked corn snacks named Crunchy Creatures. Having previously reviewed some of the Veronica's Snacks range (http://glutenfreephotos.blogspot.ie/2013/07/product-review-veronicas-snacks-munchy.html) I was definitely game to try these out. I received 3 Cheese Crunchy Creatures bags x 30g and a Cheese Crunchy Creatures multi-pack that contained 5 x 15g bags. Crunchy, munchy happiness indeed. I do love a decent gluten free snack. I was delighted to try these out. 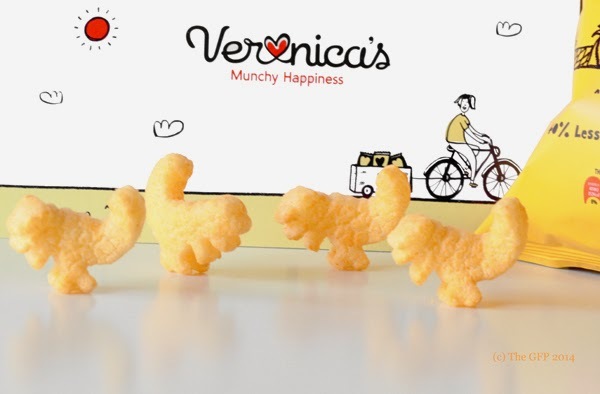 I am more than happy to promote an excellent, Irish, gluten free business and Veronica's Snacks is just that. These are clearly aimed towards a younger audience and my daughter was very willing to help me taste test them. The packaging is colourful and fun. The mascot is a tyrannosaurus and his dinosaur friends, which you will soon be able to read more about on the site, are known as the Crunchy Creatures. The bag is clearly marked with a gluten free label on the front and the back reads that they are suitable for vegetarians and coeliacs. The crossed grain symbol is present. They are also 100% organic - I love that. It's nice to see a child friendly gluten free snack coming onto the market. There will soon be three flavours to choose from: Cheese, Salt & Vinegar and Spicy Tomato. Yay! I really liked these. There is something irresistible about eating a dinosaur shaped snack. The kid in me comes out. The cheese flavour is not over-powering and is well balanced so that the actual corn taste of the snack is not lost. I would not know this was a baked snack. Very crunchy, very, very moreish. They did not last long! They are a really great alternative to crisps and to be honest, I would choose these snacks over a packet of crisps any day - they are that tasty. The novelty of dinosaur shaped corn snacks is one that I don't think I could get tired of! There's not much else to say, but go ahead and grab a bag when you see one. If you need an excuse, just say that you are buying them for some children and then sneakily keep them to yourself. Though it is fun to share - simply to play with the dinosaurs!